Mike Cacioppo, a former cabbie, tells the press how he makes more as an Uber driver. 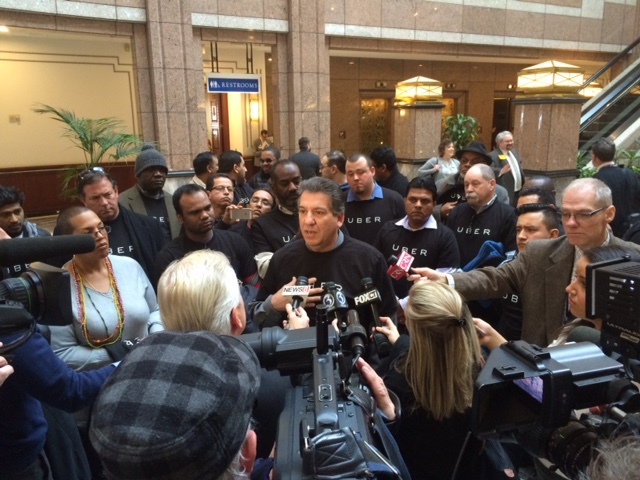 After a day of public-hearing testimony about free markets, innovation and regulation, the only consensus at the General Assembly about Uber was that the market-disrupting ride service is in Connecticut to stay. Exactly how or when to set rules for a business that’s upended the highly regulated taxicab industry was unclear Monday evening as legislators said one option was to simply collect data on Uber for another year. 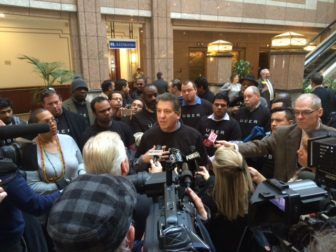 Rep. Tony Guerrera, D-Rocky Hill, the co-chairman of the Transportation Committee, said no one is seriously suggesting anymore that Uber be banned from the state, not even a taxi industry that calls Uber a corporate outlaw. A century-old regulatory system dictates whom Scalzi can hire, how many cabs he can put on the road, where he can send them and how much he can charge. It takes more than seven months to obtain permission to add a cab to his fleet. Uber complies with none of those requirements. It owns no cars, employs no drivers and charges whatever the market will bear. The company and a limited number of competitors, such as Lyft, operate a new business entity: a transportation network company, or TNC. But there is a question as to whether Uber cars should be treated as cabs, at least in the view of the state Department of Transportation and many members of the legislature, including Guerrera. “It’s a different business plan,” Guerrera said. Guerrera and other legislators say Connecticut eventually will impose requirements on Uber regarding driver background checks, insurance coverage and inspections of cars used by Uber drivers. But in a year when legislators also are being asked by the electric-carmaker Tesla, another market disrupter, to set aside long-established rules on how cars are sold, they are struggling with whether Uber should be regulated on price. So far, the Department of Transportation has not sought to bring them under the same regulatory structure as cabs, which must rely on meters to set fares for rides of 15 miles or less. Uber acts as a broker. It uses one smart-phone app to sign up drivers who use their own cars and another to match them with passengers. Uber sets the rates — how much depends on market conditions — and collects the fare electronically. The advantage for a one-time taxi driver like Mike Cacioppo of North Haven is huge. When he drove for Metro, Cacioppo paid a weekly fee of at least $750 to lease a yellow cab. For Uber, Cacioppo uses his 2013 Nissan Rogue at no additional cost. “Uber, the minute I pick up a customer, I’m making money,” he said. For him, that has been revolutionary, he said. The Yankee Institute, a Connecticut-based think tank that promotes small government and free markets, is urging the General Assembly to tread lightly. She recommended that Connecticut follow Massachusetts by imposing a minimal regulatory structure, then watch how the new industry develops. A public-policy study released Monday recommends that Connecticut consider making a pioneering effort to regulate the free-market or surge pricing of Uber, whose fares can jump tenfold at times of high demand. “The extreme of surge pricing was seen in some locations on New Year’s Eve, when a price for Uber rides increased by a factor of ten or more. So the question is whether this is opportunistic price gouging or facilitating the healthy interaction of supply and demand in the market,” the study found. Commissioned by the Department of Transportation, the study was conducted by the Institute for Regional and Municipal Policy at Central Connecticut State University. The institute suggested that the General Assembly needs to answer a basic question about Uber and other TNCs. Nicole Benincasa, an Uber executive, told the Transportation Committee that the company has voluntarily capped its rates in emergencies under an agreement with the attorney general of New York. No state, however, has imposed rules on how much it can charge. The legislation that seeks to impose some regulatory structure on Uber and similar companies was proposed by Rep. Sean Scanlon, D-Guilford, a freshman member of the legislature. His interest, in part, was generational: The 28-year-old says his friends were heavy Uber users. As research, Scanlon said, he downloaded the app to become an Uber driver and found that it took less than 30 minutes to sign up. Four days later, he was approved to pick up passengers. Instead of submitting drivers to an FBI fingerprint check for a criminal record, Uber employs a private company, Hirease, which relies on applicants to disclose their Social Security number and other data online, allowing a records check. Scanlon, who is employed by the office of U.S. Sen. Chris Murphy, D-Conn., said he has no intention to drive for Uber.